Dette sjarmerende, tradisjonelle byhuset ligger perfekt i sentrum av Olonzac, hovedstaden i vingården Minervois. Innen et par minutters gange, vil du være i stand til å suge inn atmosfæren i denne sjarmerende byen. Enten du ønsker å mingle med lokalbefolkningen på tirsdag morgen markedet, som er en av de beste i området, nyte et måltid på en av de mange restaurantene i nærheten, eller bare slappe av over en kopp kaffe eller et glass vin, har Olonzac alle du kan ønske deg en minneverdig fransk ferie! Inne i huset vil du bli møtt av et fullt utstyrt kjøkken og spiseplass med vedovn for å holde deg varm og koselig i de kjøligere månedene. Det er en lys og luftig rom med en stabil dør for frisk luft og morgensolen i første etasje. Flytting oppe er det en romslig dobbelt soverom med rikelig med lagringsplass og dusj naborommet i 1. etasje; og på den andre etasje finner du en herlig stue som har tonet glassdører som åpner og brett tilbake, utover som du vil være i stand til å sitte ute på den sjarmerende privat takterrasse og slappe av med en bok eller nyte et glass vin på en mild fransk kveld. Vi har tatt mye omsorg for å innrede og utstyre Chez Lulu med moderne bekvemmeligheter, inkludert gratis bredbånd / WIFI Internett og luksus å gjøre oppholdet mer behagelig, tilbyr vi også badehåndklær, hårføner, lokale kart og guidebøker for å hjelpe permisjon plass i kofferten for andre elementer. Mehr als eine Reise wert. Ein sehr schönes Haus mit einer phantastischen Vermieterin in einem lebendigen Dorf. It's an excellent small house in the middle of a functional little town. The house basically has three rooms: the kitchen/diner, bedroom and small sitting room with open roof terrace. There is also a shower-room/wc. It's small but it all works very well. The ground floor kitchen/diner has all you need including a good wood burning stove for cooler months. There are also electric heaters should you need them. The bedroom on the first floor is fine with adequate storage and a good bed. The sitting room on the top floor is small but with big windows looking onto a similarly sized roof terrace where you can sit out. It is all well decorated and very well kept. The owner is local and very helpful. We found parking right outside the front door to be easy, but it was a French school holiday period, but parking is not going to be a problem. The town is small but manages three or more bakeries, several restaurants and bars, post office, butcher and good modern super market - all within walking distance. It also has a good cave cooperative selling its good wine at good prices under the name of "Brian". On Tuesdays there is an enormous local market running through half of the town. It's very good with a wide range of products. Excellent for vegetables etc. The market comes within about 80m of the house - no need to drive and park. Further afield, there's lots to see and do and getting around by car is easy. We enjoyed our stay and will return. 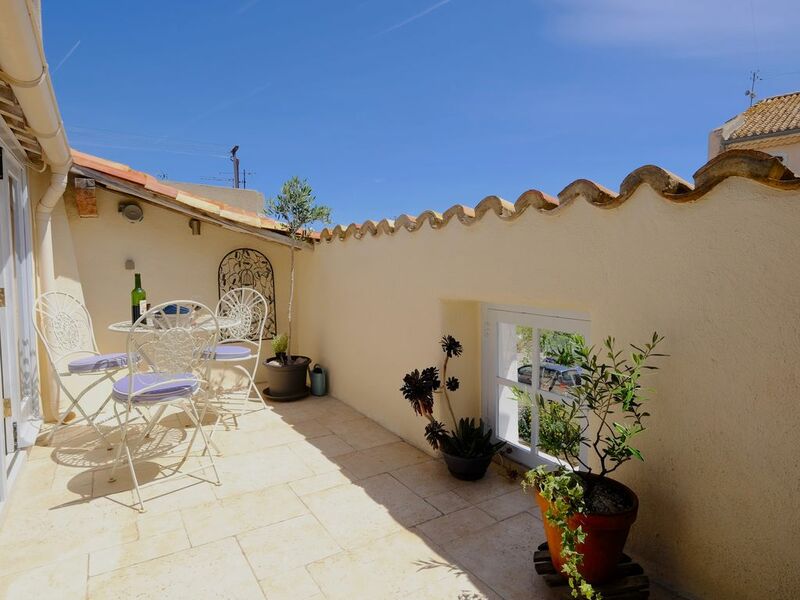 This is a lovely home in a nice Languedoc village - perfect for a taste of French village life on your holidays. It's clean, well-equipped and tastefully decorated, but the star feature is definitely the roof terrace. When we weren't out sightseeing and enjoying the lovely countryside, we seemed to spend most of our time sitting on the terrace - perfect for breakfast and aperitifs. Lucy was a really helpful and friendly host. Olonzac was a good place in which to base ourselves. It has a number of restaurants within easy walking distance, and although you have to go further afield to get the best cooking, we enjoyed sampling what was on offer in the village. Really enjoyed our stay in Chez Lu Lu. Lucy met us on arrival and imparted lots of local recommendations for things to do and places to visit. Olonzac is less than an hour from a selection of beaches and within range of the Pyrenees, so lots to see and do. We would recommend....a trip on 'Le Train Rouge' for stunning scenery, the city of Minerve, Gruissan Plage & old town, Carcassonne castle, Canal du Midi tour from Homps, Tue market in Olonzac and last but not least...great coffee and pastries in Boulangerie du Marché aux Herbes (just around the corner from the house). Liegt direkt am Rathausplatz von Olonzac und ist daher belebt und man ist schnell zu fuß im verträumten Städtchen von Olonzac. Jede Woche ist dort ein großer Markt für ein Tag, dort findet man alle Köstlichkeiten der französischen Küche. Narbonne ist als große Stadt in ca 45km per Auto gut zu erreichen und der Strand von Narbonne ( Plage ) ist sehr zu empfehlen.